Hill Trimamul Congress (TMC) Kalimpong unit constituted its women wing for which the post holders were nominated here today. In the very context, the meeting of Hill TMC women wing was conducted today wherein president Sarada Rai Subba chose representatives for Kalimpong TMC women wing. 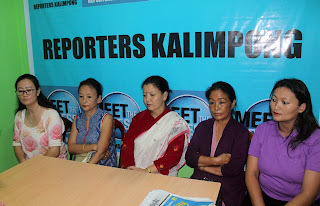 Addressing a press meet afterwards, Ms Subba informed that Sangay Lamu Sherpa has been chosen as the working president of Kalimpong TMC women wing whereas Lazika Foning has been made the secretary of the TMC women front,Kalimpong unit.Similarly, Sunila Bhutia and Sonam Bhutia have been elected as the president and secretary of Kalimpong block II women’s wing.Pralaya Sotang for Gorubathan block along with Sangay Lamu Sherpa the working president will look after Kalimpong block I, informed Ms Subba. 0 Respones to "Hill TMC constitutes Kalimpong women’s wing"